I was asked recently to opine on this topic, which I do today with some reservation, for I can see the venerable four-column menu approaching its sell-by date. The image shown here is a MenuVantage prototype from 2003. Don’t get me wrong. As I wrote here, this is still the best tool for the traditional setting in the F&I office … for as long as that setting prevails. Best practices for menu selling split into two broad categories: those that are good for selling, and those that are good for compliance. I will present them in that order. Every product appropriate to the transaction type and “car status” of the current deal (i.e. Used Lease) should appear in column one. Some menu systems use deal templates, making it easy to select the proper layout every time. The home court advantage in the F&I suite is that you can do a four-column menu, and there is a professional there to present it. For most systems, column one automatically drives the layout of the accept/decline “waiver” form. This is best practice for compliance, and it’s good selling too. Why have a product that you only present on special occasions? The practical limit for products in column one is six, maybe eight, so choose wisely when laying out the menu template. Using bundles will allow you to squeeze in more products. I generally don’t like bundled products, as I wrote here, but this is a reason to use them. Every menu should include a second, longer term, with the correct APR for that term. There is a charming story about this in Six Month Term Bump, plus a downloadable spreadsheet. Twelve months is overkill, and likely to raise an objection. The amount of product you can finance without changing the monthly payment is given by this formula. Without doing the annuity math, a good approximation is: base payment times five. The monthly payment in column four should be roughly $30 more than the base payment without products. That way, you draw the customer’s attention into the menu without a big price barrier. Likewise, payments should increase in small increments from right to left across the bottom of the menu. Obviously, the increments will be larger for more expensive deals, say 10% of the base payment. This is easy to do, if you are manually setting up each menu. It takes a little more planning to do this with templates. You can either tweak the individual products at deal time, or you can set up a different template for highline vehicles. For example, offer the platinum VSC coverage in column one and the gold in column two. By the way, do not reuse the VSC coverage choices (like gold, silver, and platinum) as your column headings. That’s an obvious source of confusion. Finally, your menu system should feature sales tools and custom content for each product, like the famous depreciation chart for GAP. I have a few more recommendations, related to compliance. If you already have a good grasp of unfair and deceptive practices, you can skip this part. Be warned, though, that consumer watchdogs and regulatory agencies are looking over your shoulder. The chart below (and the pull quote) is from the National Consumer Law Center. You can tell that the dealer in green is using a menu system with a fixed markup over dealer cost. The dealer in red is certainly making more PVR but he is also courting a federal discrimination charge. 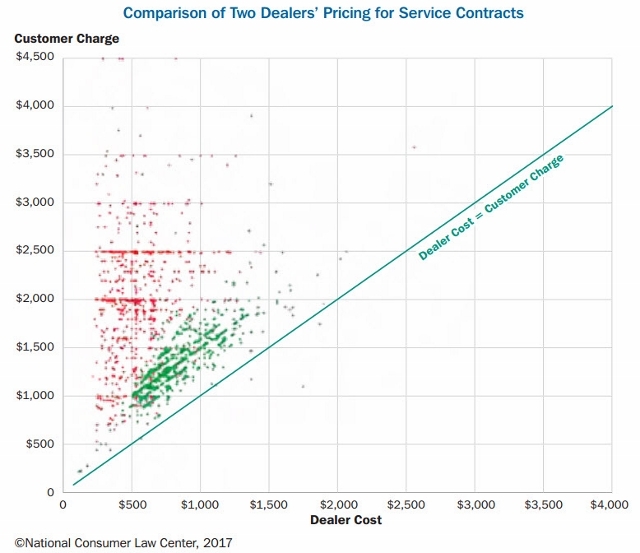 Menu trainers like to say, “present all the products to all the customers, all the time.” They might add, “at the same price.” The NCLC report goes on to show that minority car buyers are systemically charged more for the same products. Some dealers simply don’t allow the F&I manager to vary from the calculated retail price. In states like Florida, that’s the law. Giving F&I managers the discretion to charge different consumers different prices for the same product … is a recipe for abuse. The menu should display the price of each product, not just the package price. Some turn this into a selling feature by also showing the price as a daily amount. It makes a good layout to have the most expensive product at the top, with prices descending down the column. All of these measures require some kind of audit trail. I have seen some very strong systems that track exactly what was presented, by whom, when, for how much, and whether the price was changed. At a minimum, you should collect the customer’s signature on the waiver form, with all the products, their prices, and your standard disclosure text. Next week, I will resume writing about the brave new world of flow selling, self-closing, and predictive analytics. We may find that many of these practices – especially regarding compliance – are still relevant.